And now for temperatures and ice extent. Of course, the Arctic wouldn't be the Arctic, if it didn't let one radical swing get followed by another radical swing. While November also saw the largest increase in sea ice extent in the 2005-2018 period, with 2018 at one point almost taking the second highest position, the trend line on the JAXA graph has effectively flatlined into December and may very well be second lowest tomorrow: That's a big change, taking place in less than two weeks. No telling what the Arctic will do next, but I don't expect very large shifts in the PIOMAS ranking at the end of December, as most years don't deviate more than 200 km3 from the 2007-2017 average. Three more weeks and it's time to update spreadsheets for a new year of Arctic sea ice extravaganza. Have a good end of the year, everyone. Hi, Neven, hope you have a great holiday! And thanks for the update. But I think you may have made a small slip: if I'm reading Zack's monthly anomaly graph correctly, November was not 12th-coolest, but 12th-*warmest*. (That would translate to 28th-coolest.) So the difference with your measure is more massive than the current text would indicate. You're absolutely right, and I've changed the text accordingly. Thanks. Nice to see California getting some rain, which if we had normal sea ice as was years ago, would have happened earlier. I think 2018-19 will be markedly different than 16-17 and 17-18. Will have something about this in a while. Finding water with a NASA probe is a smashing good idea. However, my sea ice studies have shown that they may have not to drill too deep. Mars 95% CO2 atmosphere may also prove to be a useful comparison with our ever so growing carbon dumping in Earth's atmosphere. Why has mars got a 95% CO2 atmosphere... is that because there is no hydrological cycle to "clean it up?" Mars offers excellent studies for CO2 atmosphere without the Venusian super dense heat. I suspect we will learn a few things by it, especially the wild temperature variations. It can be quite warm on a nice Martian day. Identifying if Mars has a lot of water (ice) in its underground will be the big story from NASA InSight lander , if they find ice not so deep below it will be the #1 story in the world for more than 15 minutes. Ice being our expertise, will bring our attention there. Yes, but Wayne: does the fact the atmosphere of Mars is mainly CO2 directly relate to the fact there is no hydrological cycle ? Similar with comets there is water or signs of water on top of asteroids. Mars has very thin atmosphere, most of its oceans water had only 2 places to go, towards space or underground. So how deep is the water buried is the question. 2016 all time minima record sea ice extent is about to be broken by current 2018 JAXA. This is the main action to watch, along with a definite Arctic circulation change which makes this data even more interesting. ..... After all Mars is the red planet, rust ! Given that its Oceans disappeared a very long time ago, Asteroid impact craters and dumping of star dust over eons should have changed that colour a bit. So I suspect some sort of water exchange and reactions, however small it may be. Um, who's saying Mars ever had oceans? Mars perhaps had an ocean. There are formations that look exactly like wave cut benches around a basin in the Northern Hemisphere, along with deltas, all at close enough to the same current altitude. The simplest explanation is a water ocean. "A primitive ocean on Mars held more water than Earth’s Arctic Ocean, according to NASA scientists who, using ground-based observatories, measured water signatures in the Red Planet’s atmosphere. Scientists have been searching for answers to why this vast water supply left the surface. Details of the observations and computations appear in Thursday’s edition of Science magazine. Perhaps about 4.3 billion years ago, Mars would have had enough water to cover its entire surface in a liquid layer about 450 feet (137 meters) deep. More likely, the water would have formed an ocean occupying almost half of Mars’ northern hemisphere, in some regions reaching depths greater than a mile (1.6 kilometers)." The standard opinion in astronomy has long been that water dissociated into hydrogen and oxygen due to solar radiation in the Martian atmosphere, and the former preferentially escaped into space due to the planet's light surface gravity. Oxygen combined with iron in the crust. The same processes must have occurred on Earth, but the rate of hydrogen loss was much lower and the 2H2 + O2 <-> reaction managed to reach an equilibrium until an ionosphere formed to protect the surface from solar radiation. All this must have occurred in our own primordial atmosphere long before the release of biogenic O2 reintroduced free oxygen to the atmosphere in large quantities. Its a purely descriptive, qualitative explanation, but it makes sense. Mars lost its ocean because it didn't have enough gravity to hold on to its hydrogen. I meant, of course, 2H2 + O2 <-> 2H2O. Incidentally, in this environment it is possible that conditions existed that favored production of peroxides. Hasn't there been evidence of peroxides in the Martian soil? Elisee, much appreciated: but, do you know if anyone has a theory as to how Mars got its water in the first place? Our solar system asteroids seem to be loaded with water along with comets, etc. How did Mars get its water? Probably the same way Earth got it, although astronomers seem to be divided on that issue. Some say it originated in local volcanic processes, others feel it came from bombardment by comets. My guess is it was probably some combination of the two. As Wayne points out, the solar nebula, particularly in the early days, was loaded with water, as well as other volatiles such as methane, carbon dioxide, ammonia and perhaps others. These compounds are common in the interstellar medium (IM) as well as in the molecular clouds where stars (and solar systems) form. There have been several dozen complex molecules detected in the IM by their radio emission, including many organics such as alcohol, formaldehyde, etc. Even amino acids have been found in meteorites (probably of non-organic origin). There is a lot of active chemistry going on in the yawning gulfs between the stars. The chemistry that led to life on Earth probably already had a good head start long before the primordial planet cooled off. This explains why microbial life seems to have originated so soon in Earth's history, and it suggests that other planets may have had had conditions in their history conducive to life. ..and a Happy New Year to all! I'm not "D". I'm Jim Hunt! I finally seem to have worked out a way to log in (via WordPress.com) in order to wish all at the ASIB a Happy New Year! Anyone for a sudden stratospheric warming and a split polar vortex? It seems as if the only way I can log in at the moment is by selecting the Twitter option, and that doesn't seem to work reliably. "America’s government shutdown has become the longest in history. Hundreds of thousands of federal workers remain either stuck at home or forced to work without pay." "Due to the US Government Shutdown, PIOMAS ice volume and thickness data which depend on federal government generated reanalysis products, are currently not updated." Sorry to hear logging in is problematic again, Jim. And sorry I didn't get back to you earlier (I was gone and then picked up some flu strain from the Balkans). If things don't improve until the end of the month, I'll contact Typepad. As for no PIOMAS update, it's a shame, but the best time for it to happen. Let's hope things get resolved soon. How do you manage to (apparently) log in so reliably at the moment? Or split and moved to Siberia and Canada if you prefer. Click the image for a closer look. In the meantime, DMI shows 80 degrees north colder than usual, and ice volume starting to separate higher than the past few years - any hope of getting a January post? Is there another site (besides DMI) that would have a take on thickness/volume? My comment (above) seems to be holding up - per DMI, avg Arctic temp seems headed for a low compared to 10 year average, and maybe lowest of last 10 - any ideas why? Ice volume up steadily as well. And with extent below normal, avg thickness must be up as well - any projections for the season, anybody? Sorry for not replying earlier. My impression so far - although I haven't monitored the situation very closely - is that this freezing season is going a lot better for the ice than recent ones (that were quite disastrous for the ice). What that means for the melting season is impossible to say. I usually take a comprehensive look once the freezing season is done. In the meantime, I hope the US government shutdown is over soon (also for the people suffering from it, of course), so we have the necessary PIOMAS and temperature data that are vital for having an idea of what's going on. "During summer, atmospheric conditions are responsible for 50 % of September sea ice thickness variability through the positive sea ice and melt pond albedo feedback. However, atmospheric winter conditions have little impact on winter ice growth due to the dominating negative conductive feedback process: the thinner the ice and snow in autumn, the stronger the ice growth in winter. We conclude that the fate of Arctic summer sea ice is largely controlled by atmospheric conditions during the melting season rather than by winter temperature. Our optimal model configuration does not only improve the simulated sea ice thickness, but also summer sea ice concentration, melt pond fraction, and length of the melt season. It is the first time CS2 sea ice thickness data have been applied successfully to improve sea ice model physics." From: Schröder, D., Feltham, D. L., Tsamados, M., Ridout, A., and Tilling, R.: New insight from CryoSat-2 sea ice thickness for sea ice modelling, The Cryosphere, 13, 125-139, https://doi.org/10.5194/tc-13-125-2019, 2019. Looking forward to January update. Welcome back NOAA, NASA and the rest, we missed you! WE go to Austria , where Neven lives, swamped by snow, it was wet as expected because the Vortex was mainly Siberian centric until very recently. The "Polar Vortex" is making waves again, I explain why record shattering cold temperatures have been influenced by AGW in the simplest terms possible. NOAA has updated its SAT data. I've posted the graphs over on the forum. 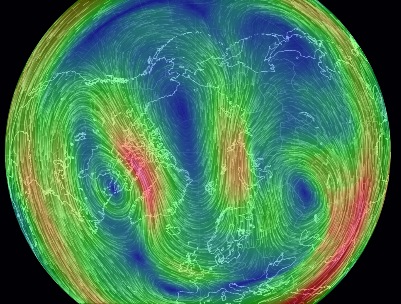 There is a literal explosion of Polar Vortex news articles all over the media landscape. But it is not accurately presented, on most cases, sometimes presenters have it right, a BBC meteorological presenter just broadcast " the Stratospheric Polar Vortex is too high" to be the Polar Vortex we are discussing. In the Guardian even..... my work never ends :) . The latest Polar Vortex was extremely interesting especially with the context of vanishing sea ice. -39 C 700 mb Upper Air measurement over Michigan was the coldest such reading for the entire winter to date until the next day in Siberia. (my range of Russian weather maps covers a rather restrained area, but I believe -40 C reading was the minimum of the season so far). The full impact of thinner sea ice is rather misunderstood, but it does affect the size of the Arctic Polar Vortex. Which has everything to do with weather. The freezing day anomaly FOR 2019 has gone back to the average for the 2000s!